There is a lot of talk about Local SEO these days. SEO has been around for several years now. Local SEO has shown up more recently. Nonetheless is has grown much over the last 2-3 years. Local SEO is basically focussing your search engine optimization locally. Attracting local customers with SEO. The advantage is that you can focus on customers nearby and that you are likely to have a lot less competition than when you decided to keep on a global level. For a lot of clients when done well, local SEO can be a real godsent. And therefore it is highly recommended on doing local SEO. And for that some time has to be spent doing research on your local standings. One of your best free tools for that are Google search and or Adwords Keyword Planner. I will be using Google search in this article for a nice test case. 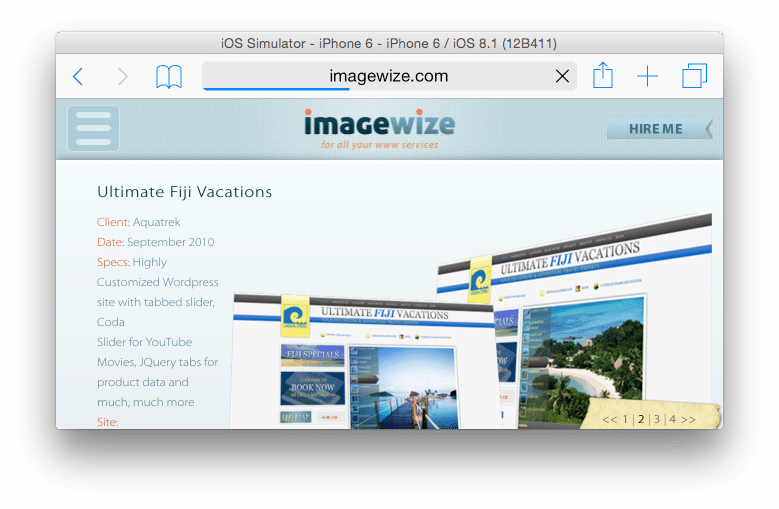 Imagewize has been located in Amwaj, Bahrain for 2 years now and we are in the business of webdesign and online marketing. This means we help customers with webdesign as well as SEO and content marketing. 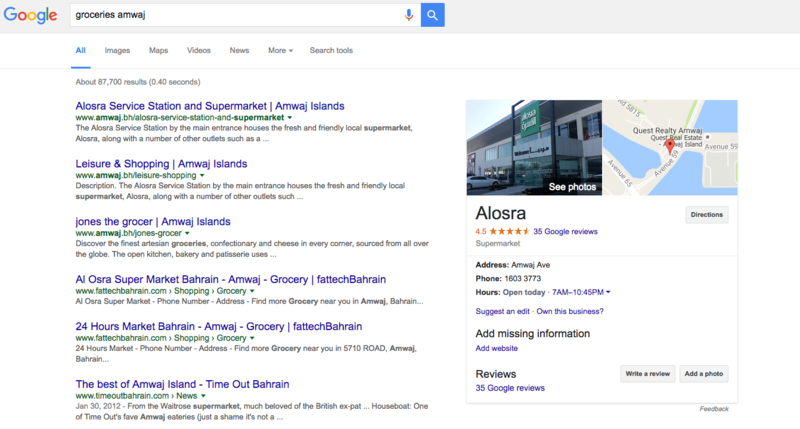 I thought it would be fun to do a short local SEO test on groceries in Amwaj. This as I met Amjad Puliyali the other day at CH9 for SeedStars GCC. He set up Baqala – a local groceries delivery service. So I thought, let’s do a little digging on Baqala and local SEO. 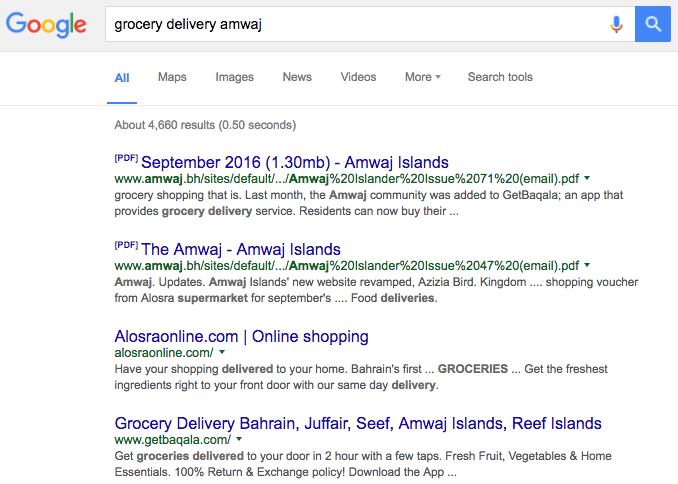 When I use google.com.bh and search for “groceries amwaj” I do not see Baqala on page one. I see Alosra, Leisure and Shopping Amwaj Islands, Al Osra Supermarket Bahrain, Jones the Grocer and others. This seems to be partly due to meta data on the page. 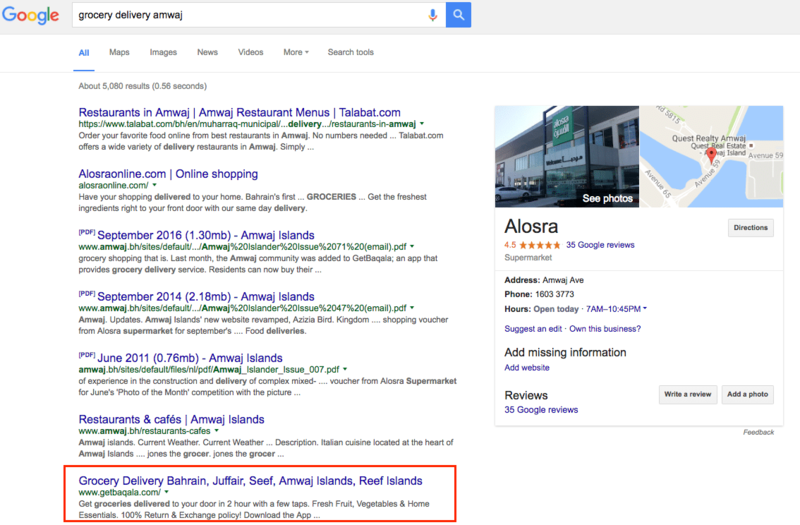 Other stores have Amwaj and or supermarket loaded by Google for meta description. Baqala has groceries, but not Amwaj or supermarket. The latter makes sense as it is a delivery service. Changes depend on searches being done and data being changed. Perhaps my searches are even changing things as we speak. They show up at the end of page two. Bigger focus so harder. Would have been great to see them on that map perhaps. Or at least at a later stage as well. If Baqala would ever want to expand and show up more nationally they would have to work on that too. Still, showing local availability and so working on local SEO will matter. It is more specific and there will be less competition. People tend to search local. So you have to be there. As Baqala is not only delivering in Amwaj they cannot of course only focus on that location. As you see in search results to focus on several regions such as Seef, Juffair, Reef, Amwaj. Sometimes you have to be more general in your Local SEO or at least be more regional. They could however consider tweaking their meta description for the homepage. Or they could consider adding pages for specific locations in Bahrain where they deliver. That is often how bigger players do it. They either create separate pages, subdomains or even sites dedicated to specific regions. In the case of Baqala a separate page or specific mention could improve their standings for sure. in Google does not get me a lot of links and few local links. So there is definitely room for improvement there. I did not see Baqala registered with Google for Business. Which would give them a map, images and other details in the right sidebar when searching for them. It could also give them a potential local SEO boost. When I looked them up on Google Maps I could not find them either. So here too room for improvement. Showing store location including delivery areas such as Amwaj would definitely help with general SEO and local SEO as well. Local SEO and general SEO is an ongoing process and there is alway more to be done. So it the case for businesses like Baqala who could benefit from more local SEO in Amwaj. I must say they do really well overall though. They show up either on page one or two and seem to have enough content to stand out locally in quite a few situations. So thumbs up for Baqala! Perseverance and vigilance is important. Constant tweaks to SEO and local seo as well as content marketing matter. As I mentioned a few times there is work to be done for Baqala still. And if they or you need a hand, Imagewize is nearby here at Amwaj waiting to lend you a hand. It looks like the guys are quite active on SEO – I just googled the terms you mentioned and I can see pretty much all are ranking well for them. May be it’s time for you to update the post. Thanks for the feedback Zaqy. I really appreciate it! Met the founder partner Amjad at CH9 a while ago and we had a great conversation. I am sure Baqala is working on its position SEO wise whenever it can. I see for example they are now using Google Ads as well. 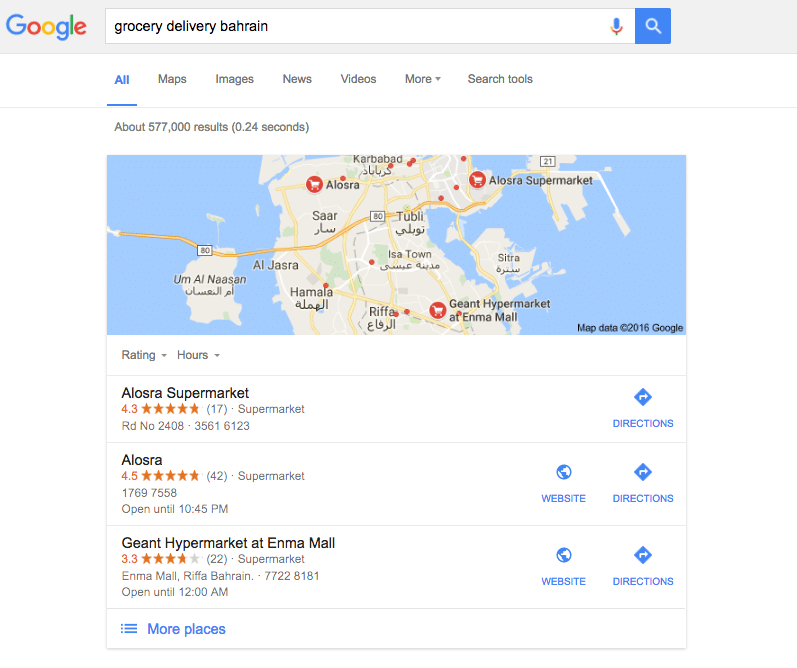 I saw this on page two when I searched google.com.bh for “grocery delivery bahrain”. There at the top I saw their ad and also saw they had moved up on page two for this long tail keyword search. Awesome news. Google rankings and the internets are constantly changing. Good to see and hear they are doing even better on the web!